Just Julie B's Stampin' Space: Birthday in the Barnyard! This Birthday in the Barnyard party set is perfect for the birthday celebration of your darling little girl. 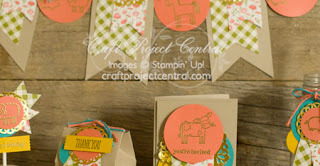 This set features the Barnyard Babies Stamp Set... with the support of sentiments from the Something to Say and A Dozen Thoughts Stamp Sets. Also highlighted are Farmers Market Designer Series Paper and Pretty Petals Designer Series Paper Stack…in combination with bright, fun Calypso Coral, Bermuda Bay and Crushed Curry Cardstock. Gold Metallic Doilies and Gold Embossing provide a lovely bit of sparkle to this ensemble, and baker’s twine provides just the right amount of country feel. This party set includes a 3-1/2” x 5” party invitation, a barn shaped thank you party favor, a cupcake pick, a milk bottle medallion and a party banner. And…there’s a bonus! This set is also incredibly versatile in that, with a small color change it would be a fabulous foundation for the birthday celebration of any handsome little guy. And there’s more…a simple sentiment switch on a couple of the pieces would easily convert this party set to the perfect background for a baby shower…for a boy or a girl! This fun project was made by Sue Plote, and you can get her tutorial when you subscribe to the month of July over at Craft Project Central.